It was H.O.T here in Oregon yesterday, 102! Ugh! I couldn't do anything but sew...even that was difficult with the iron going. 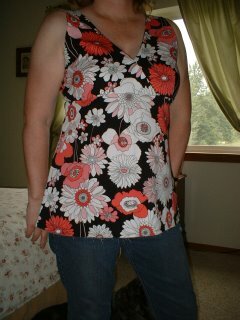 Same top as before, just lengthened a little with a 2 inch band added to the hem...Denyse Schmidt fabric. 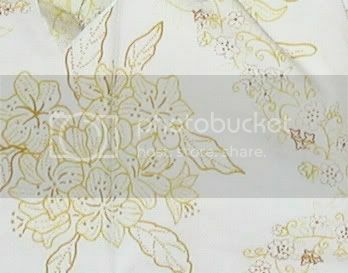 It is taken with flash, but that's ok because the beautiful golden print comes out fine on the fabric. You see, it is past 10pm here and it is bedtime soon... I guess I can finally sleep now that is done and I don't have to go to my friends's wedding naked ;). 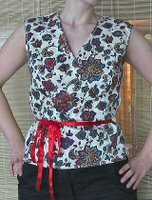 The pattern is still the Burda 8103, changes I made is the clasp in the front and it is 5cm shorter than it is supposed to be... 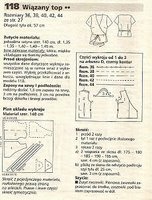 The pattern is a bit challenging, but I found the instruction adequate. 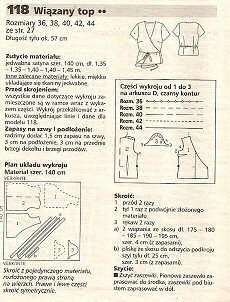 I don't have any formal education in sewing, but I Finland the public school program includes some basic sewing and knitting skills. For those of your who want to exercise more of your sewing muscles, two of our members, Anna and Alissa, have started a fab new sewalong called Sew Retro! 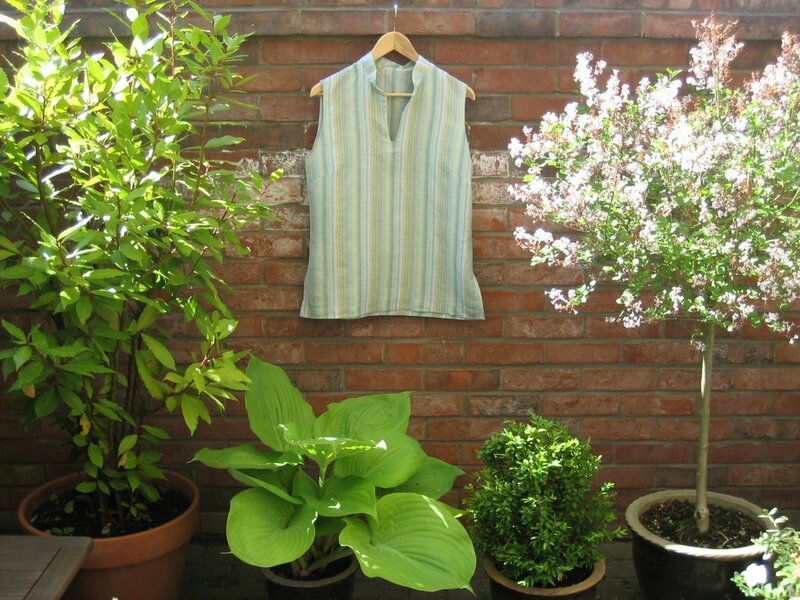 "Sew Retro is a sewing group for those interested in making vintage or retro style clothing. We're not limiting ourselves to only truly vintage patterns and/or fabric, but embracing retro and vintage styles in all forms. 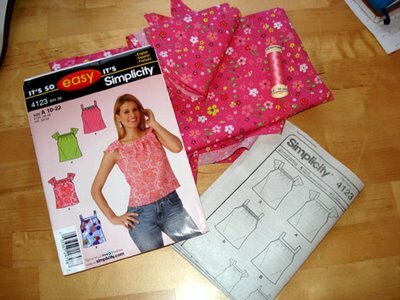 We will be having various sew-alongs but with quite general inclusive themes (ie a Simplicity pattern, a flowered fabric, a 50's pattern, that kind of thing) which members will be able to join in with if they so wish. We are also hoping to be an open forum for all things related to vintage pattern sewing, such as questions on pattern wording, fitting patterns to your figure, where to find certain fabric, notions, patterns etc as well as showing off your handywork and making us all jealous!" I finished my top. This pattern was super-easy, even for me. My only complaint is that the front gapes open a bit. I may wear it over a stretchy tank. 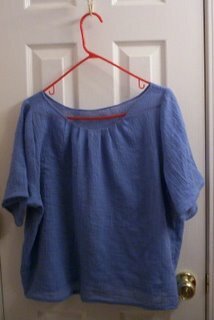 It turned out like I wanted: a fun, cool, casual summer top. 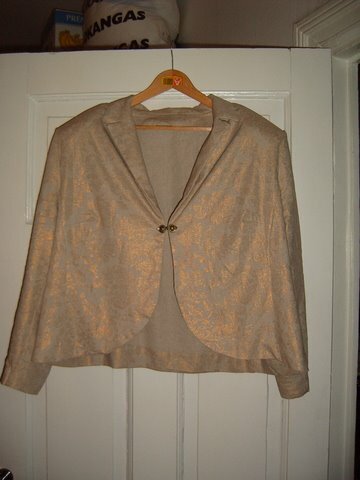 I'm hoping to make some chocolate brown bermudas to wear with it. 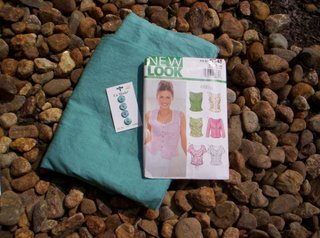 At last I've chosen my pattern and fabric for the current project. I'm going to make Vogue 2308, an Anne Klein wrap top in white linen. 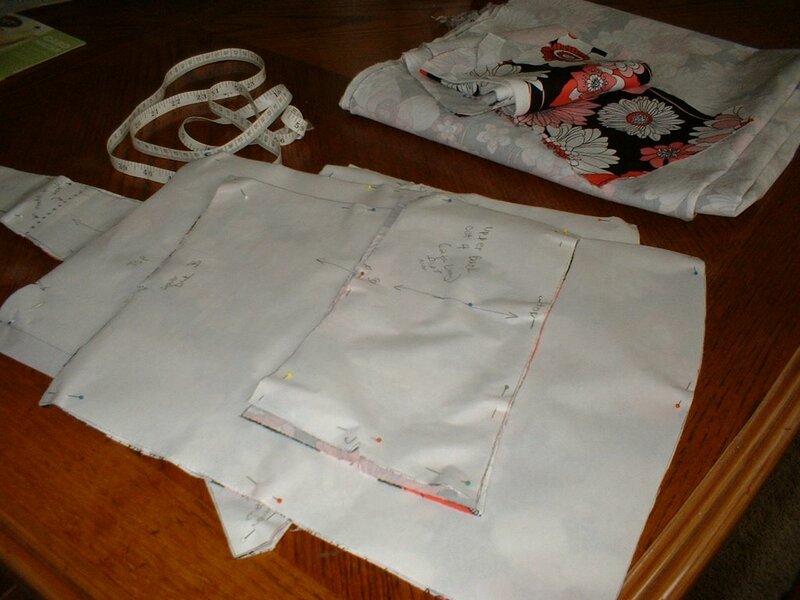 I'm looking forward to getting started on the actual sewing. All the tops finished so far look great! 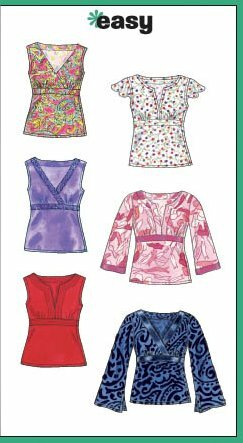 Pattern - sort of self-designed; I based the shape of the top on a princess-seamed dress pattern that I'd used before, and just sort of winged the rest. 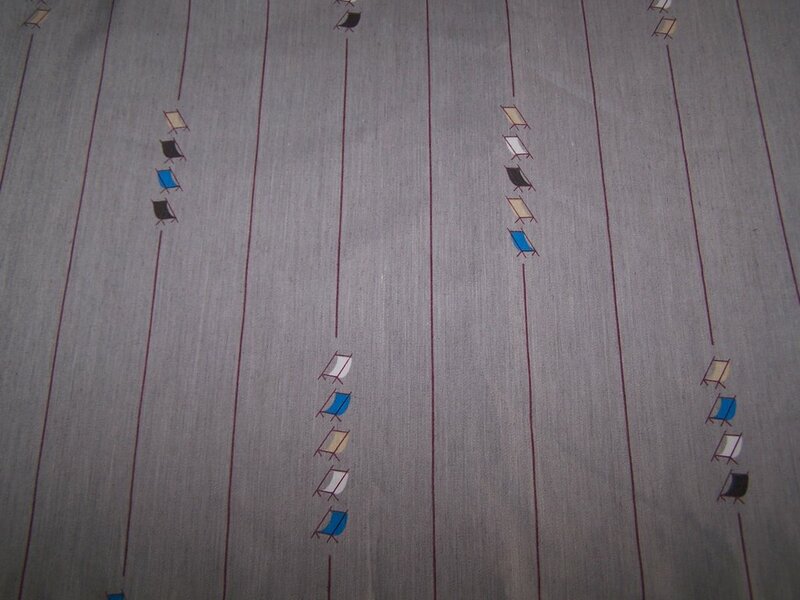 Fabric - 1 yd. 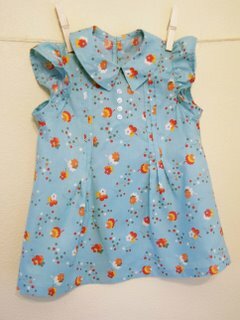 of "Kitschy Kitchen" printed cotton by Robert Kaufman and 1 yd. turquoise cotton for the lining. Trim - turquoise grosgrain ribbon by the spool (from Jo-Ann Fabrics). I'm quite happy with how this turned out. 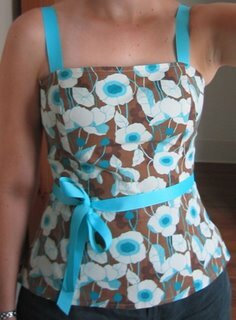 I love the fabric and this is pretty much exactly what I'd envisioned when I bought it. The sash/bow is removable, in case I happen to be in a less girly mood when I'm wearing it. My nephew just turned one, these are a late birthday gift for him along with a floor quilt to match. He was born with a teeny, tiny aorta so he had to have open heart surgery; I had made shirts like these to help with the clothing/dressing changes...now they're requested because they make great jammies! They close with twill tape on the inside and velcro for the outer flap. Pattern is Simplicity 9782. Haven't started anything for myself yet! 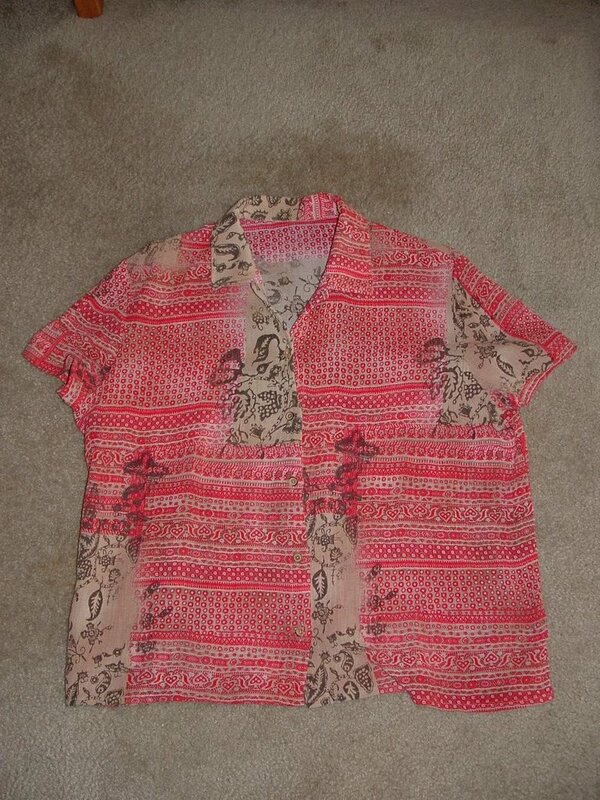 I love this shirt, it's so cute and girly, very me. All I have to say is that I want to make another one!! Only mod I made was adding elastic on the sleeves to keep them down. Nicer pictures of me wearing it to come when the weather is nicer and I find a photographer. I haven't decided yet. She is almost done and I am leaning to the modified tank version. 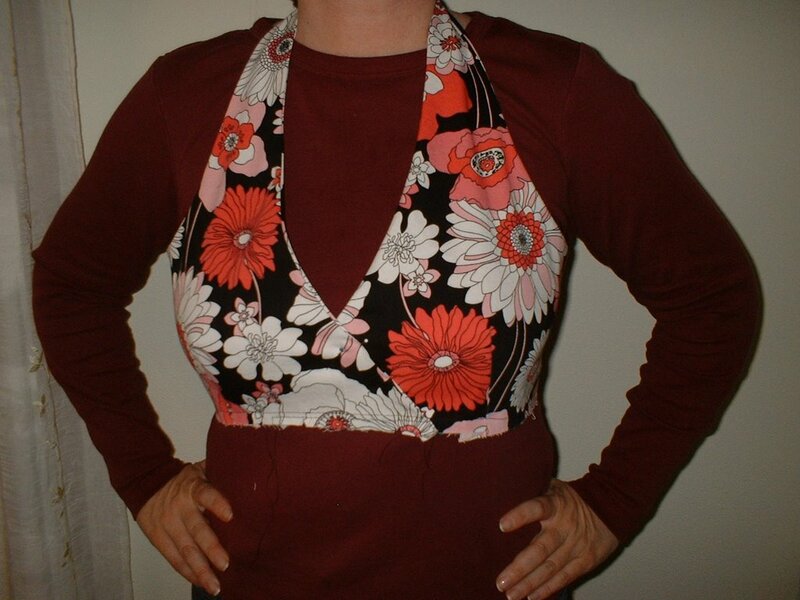 I think I would wear it more (the girls feel more contained) than a halter. The halter part tends to pull too much on my neck. The perils of a big bust. 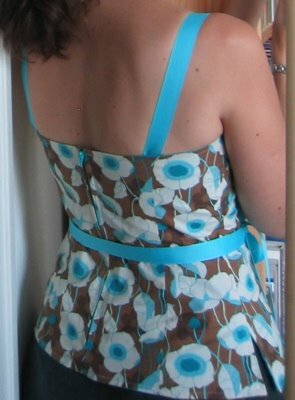 I was able to omit the zipper in back due to the stretch in the fabric. I can just slip it on over my head. It is just basted for now - I am "living with it" for the weekend before I decide. p.s. it is cold and rainy where I live - not much tank top wearing going on this summer :-( eek! look at that pale skin. Well, I kinda washed out in the bag-making category for this sew-along. I got the multitude of pieces cut out and the straps pinned for the Amy Butler Ultimate arts & craft tote. I am still contemplating how to change the pockets to suit my knitting style. But I wanted to show you the bag I made last week to carry a sock knitting project. It was based on Trek's sock bag and My Leetle Bag. Next time I will try to actually read the directions. What the heck, it looks cute and serves its purpose. This is the only Bernina in the world that won't do automatic buttonholes, I believe. I use my Brother for embroidery and buttonholes. When I am really in sewing mode, I have the serger out too. The casing, though done incorrectly, still has two layers, and was not folded over. Must be the heavy cord, from stash, that makes it look that way? That's where I messed up, and had to open the seam to turn the bag right side out. I ended up getting fed up trying to turn the ribbon ties inside out after sewing them up, so I left them out. I also think that despite cutting the pattern to specifications, the lower back panel should have been longer, so I ended up sewing on a ruffle to compensate. Thanks everyone! I love seeing what y'all are sewing! I, too, misread the deadline. 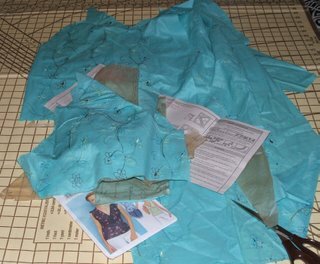 I thought I was not going to make it, since I bought my fabric on June 4th, and have yet to cut it out. Plus, I'm going on vacation next week. Phew! 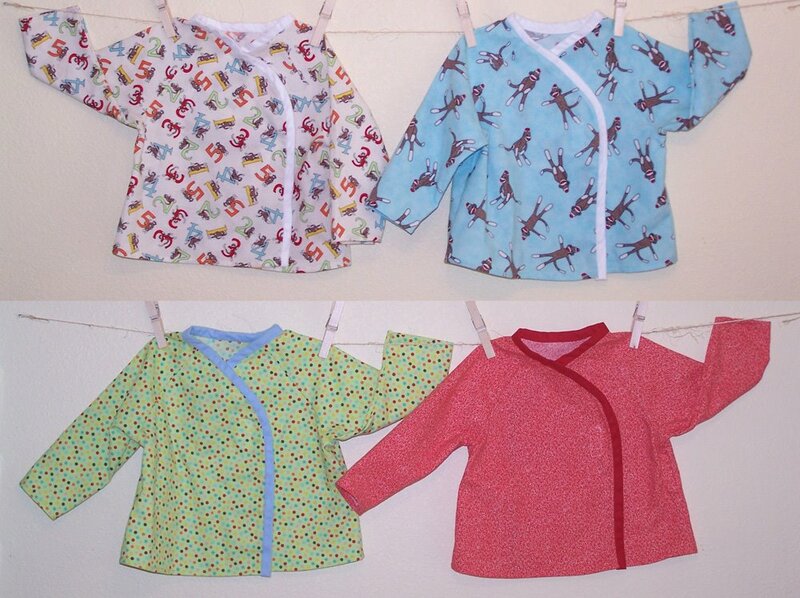 I love all your blouses, it seems like our wardrobes are growing! 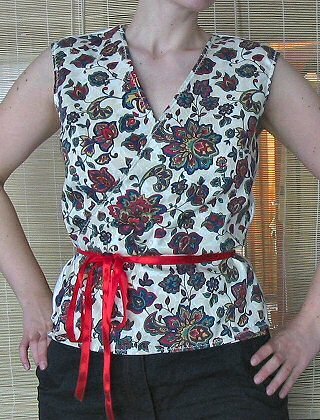 Since some of you asked about the pattern, here it is: I used a pattern from an old Burda, 3/2004 issue, pattern 118, (I only skipped the sleeves part and used a satin ribbon). I am an almost-complete sewing newbie. 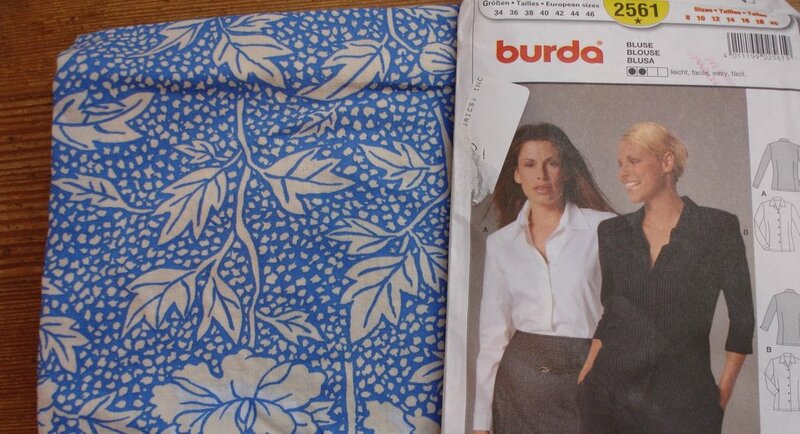 I've only sewed one pattern, a Burda wrap skirt. 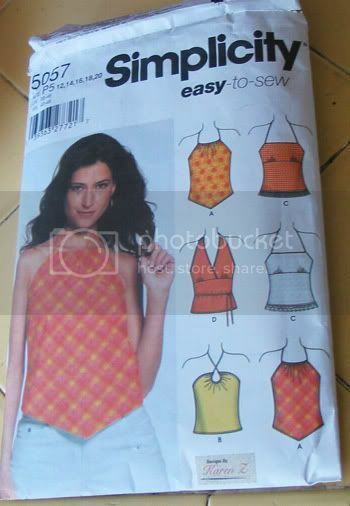 The cheerful "easy" printed on the pattern is somewhat reassuring but I'm skeptical of zippers. My husband, who has a couple months more sewing experience than I do (and so is the "expert" in our immediate family) claims that zippers aren't too difficult but has a few horror stories about trying to ease sleeves. 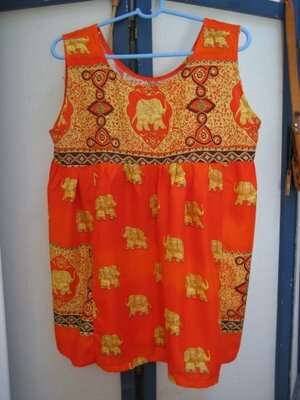 I plan to make this out of an abstract Batik-print cotton. Other than that, I am a sock-knitter, an artist (by hobby), a computer wrangler (by trade) and I would really, really like to learn to sew nice clothes that fit because (like many people) I'm convinced that clothing designers hate me. This blog is just the kick in the pants I need to get this done, so thank you for providing it to help us newbies along! Hi, I'm a new member. My name is Emily, I'm 39 (really!) and I live outside Chicago. I am an artist (quilts) and mom to three young kids, ages 6, 4, and 1. 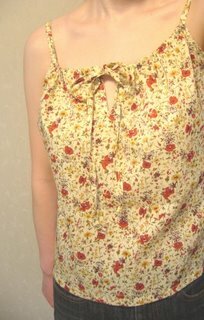 I have sewn clothes since I was a teenager. 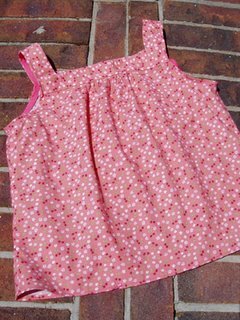 I used to make more clothing than I do now, because other projects: quilts, knitting, kids, have taken over. I hope to get back into it, I love to sew. 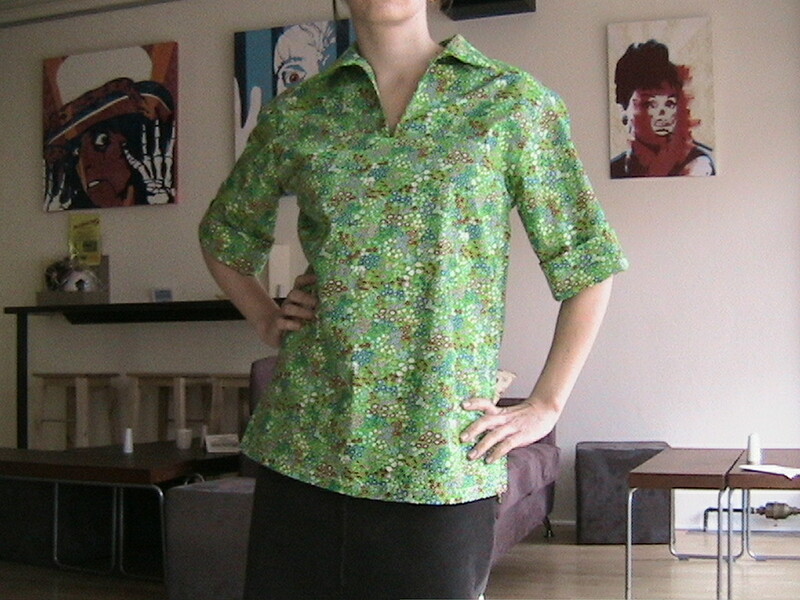 I made a blouse last month, before the sew-along started, and you can see it on my blog. 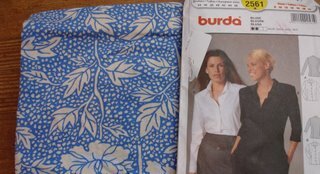 The one I'm making this month is going to be the same pattern, Burda 2561, only I'm going to make it short sleeved and change the collar. 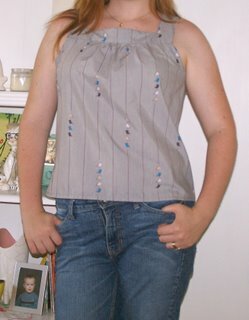 I'm listed in the sidebar as doing the Artful Dodger pattern from Hot Patterns, but I liked the way the blouse from this pattern turned out so I changed my mind. To make matters even more confusing, I'm listed incorrectly in the sidebar as "Erica P" instead of "Emily P". I've been enjoying seeing everything you all are whipping up. Glad to be a part of this group! Unpleated material! Not good. Does anyone see what I am doing wrong here? More pictures on my blog. Helpful tips desperately needed! I have managed to complete my tunic top, I really enjoyed getting the sewing machine going again after a very long break. This pattern was simple to follow and the fit is not too bad. 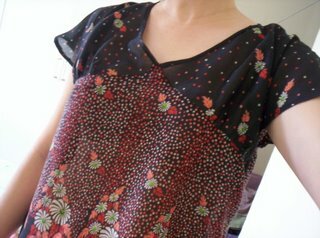 It did need some adjustment to the arm holes which seemd tight for this style of top. 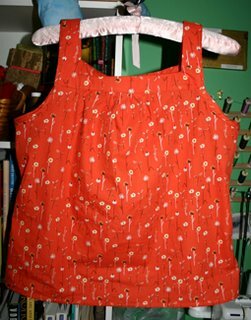 I even managed to make the bag which was also included with this pattern, I had enough fabric left over for the bag lining and used fabric from my stash for the outside. 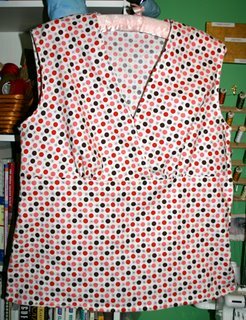 The bodice portion is finished. I like the fabric, I like the pattern, I am just not sure of the finished product. Here's my version of the Amy Butler Cabo Halter. 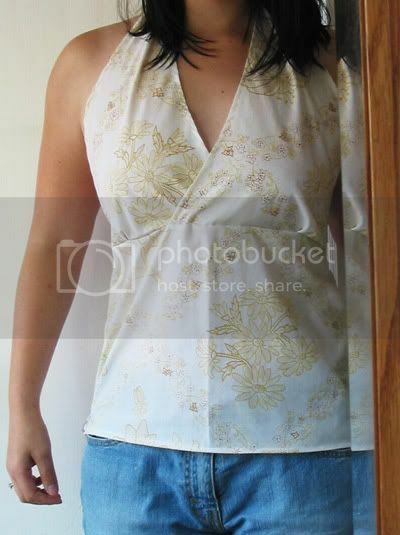 As you can see, I've converted it to a tank top style. I'm really proud of the fact that (for once) I've finished ahead of schedule. I used some silk kimono fabric from my stash. More details about the top are on my blog. My intention was to make myself something for this group...I've gotten a bit side tracked. You see, my friend's daughter just had a birthday and I hadn't sent anything. 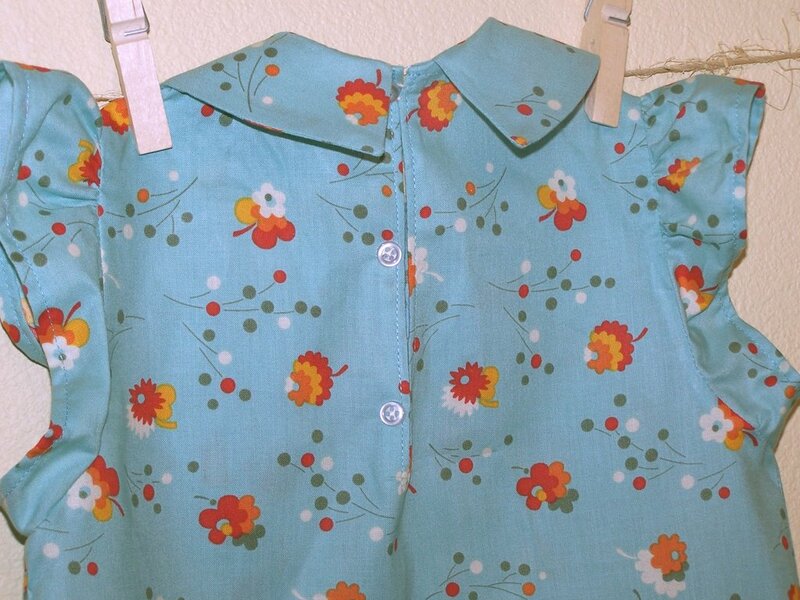 I had picked up a vintage pattern on one of my thrifting adventures that was perfect! 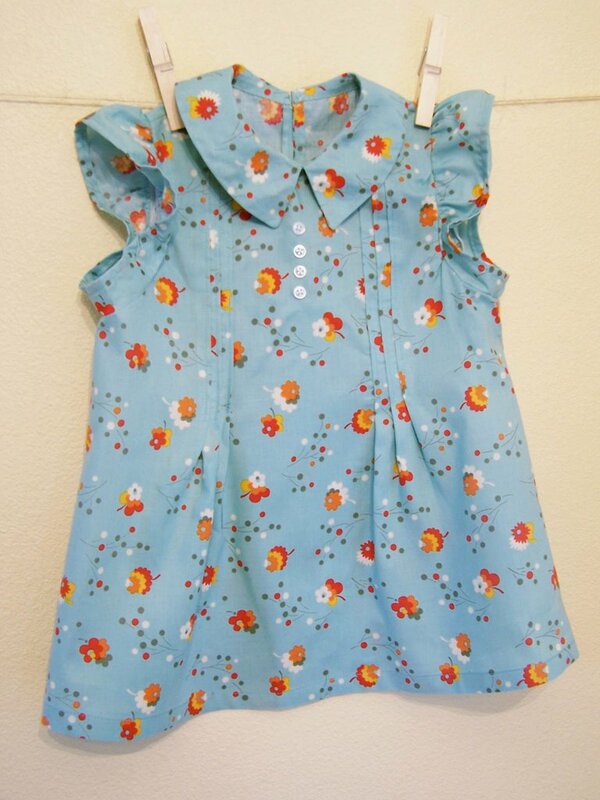 The shirt is made from Denyse Schmidt Flea Market Fancy (I'll wait while the quilters pick themselves off the floor...); the front has faux buttons, tucks, and a peter pan collar, the back closes with 3 buttons and loops. 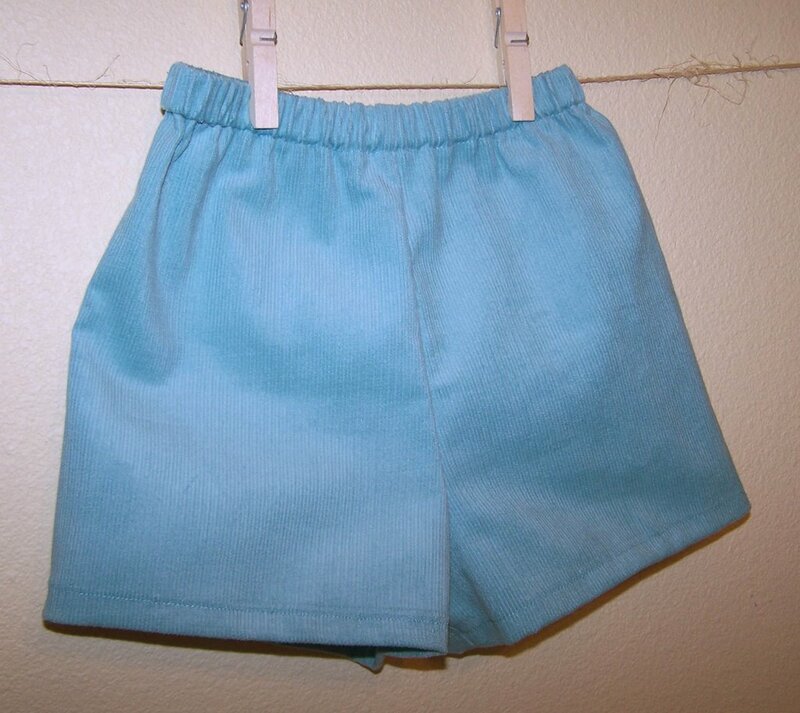 I also made shorts to match from corduroy. Hopefully, before a new theme is posted, I will get a shirt of my own in! I picked up the fabric for it on another one of my thrifts. 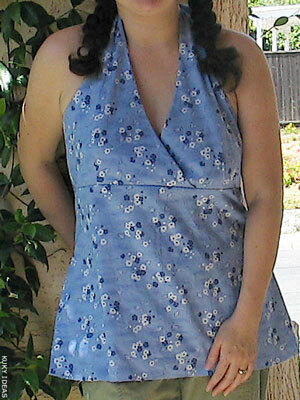 Here is my summer top -- Butterick 3383 in blue cotton gauze. 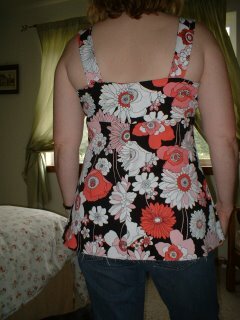 I think I must have chosen too large a size, because the neckline ended up having a Flashdance off-the-shoulder effect. I solved this by pleating across the front at 2 cm intervals, roughly collarbone to collarbone. The effect is like a peasant blouse, and a little shapelier than the original. 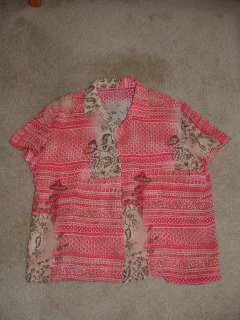 I think this will be a cool and pleasant top for summer, and good under jackets in the fall. The pattern was very easy, and very fast, too. 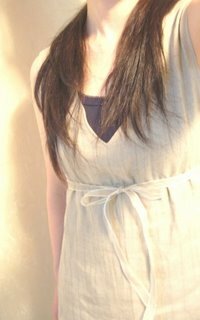 I will make it again -- using a smaller size. 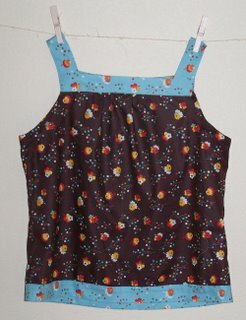 I have a few shirts that I want to make during this challenge, this is one that wasn't on the list but snuck in after I found this fabric on Friday! 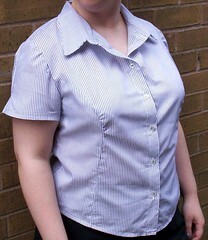 It is from Simplicity 4589, it's the third time I've used this pattern now and I love the shirts I've got out of it. I'm sure it will keep garments appearing in my wardrobe for a while yet! I'm making some quick knit tops, and I can't seem to get a good effect on the edgings. 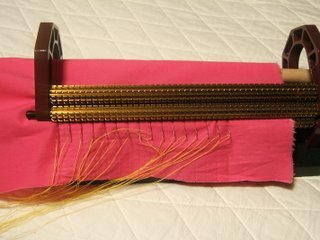 I have an ordinary straight stitch machine, and haven't liked the look on the machine -- but hand hemming seems to roll oddly, though I feel that I'm pretty good at it with wovens. 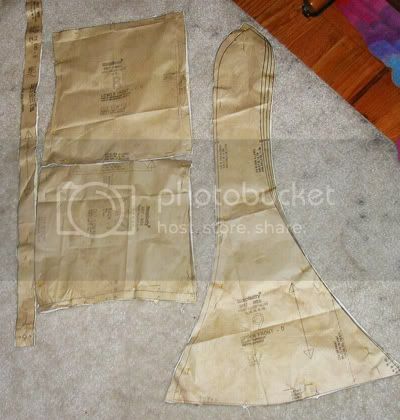 Experienced seamstresses, any ideas? Thanks! 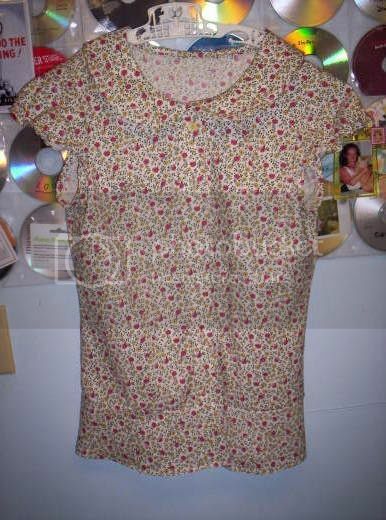 I found the pattern easy and very quick, i finished it today but took the collar off and sewed it on again because i was unhappy with the stitching, it still didn't look good but i decided to leave it as it is, it's mostly hidden anyway. I'll probably make another at some point so i may use some scrap fabric to make a practice collar before i do. Not bad huh? I love it, i've impressed myself! It turned out better than i expected. Oh, and why do i always have my hands on my hips? 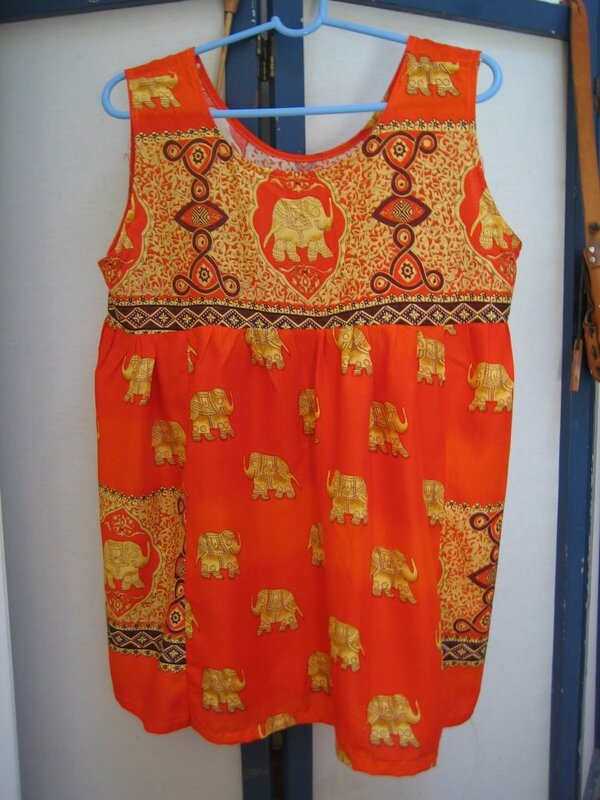 While shopping my closet recently, I came across this dress. 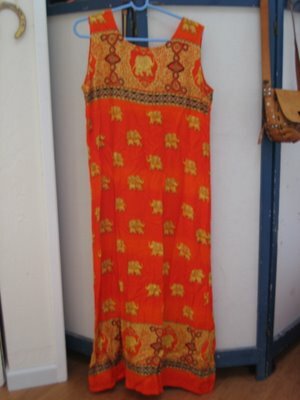 It was a looooong drink of orange...purchased from a thrift store for $3, I realized I had only worn it once. Time for a re - vamp! And just in time for..... Top Month! 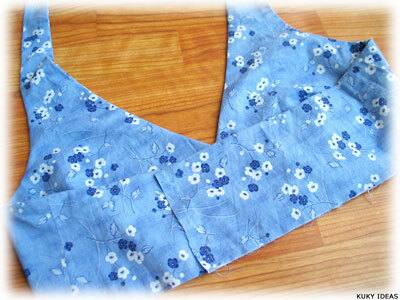 Now my little smock top looks juicy with jeans or a little straight black skirt and my gold hippie sandals. What was old is new again! The best fashion bargains can be right in your own closet! See more pictures and read the tutorial here. I finished the projects that needed to be done and put aside the unpacking so I could start my shirt! I read the back of the envelope and...gasp!...I need the bigger size! I swore I picked up the right envelope! 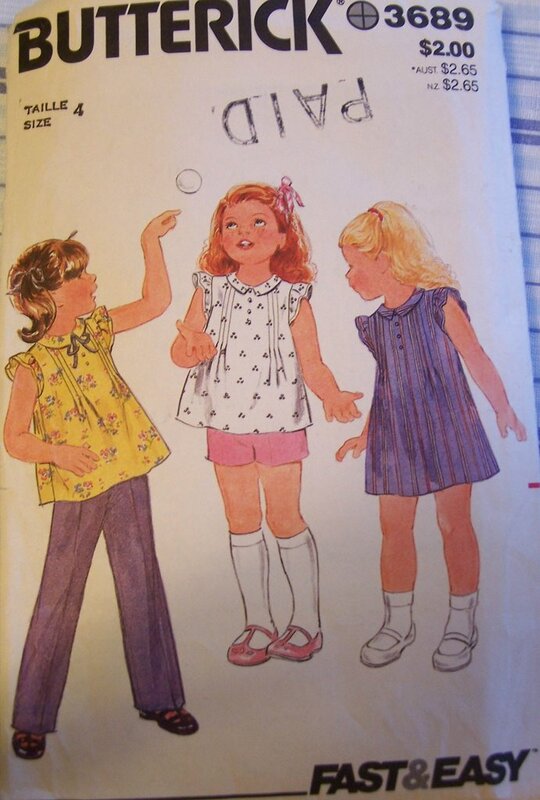 If anyone wants a Simplicity 4589 in the size range 6-12 (30.5 to 34 inch bust) email me at pinkrocket dot comcast dot net and I'll mail it to you! Pattern is spoken for! Thank you! I reached my goal yesterday to get my pattern pieces cut out. There they are. 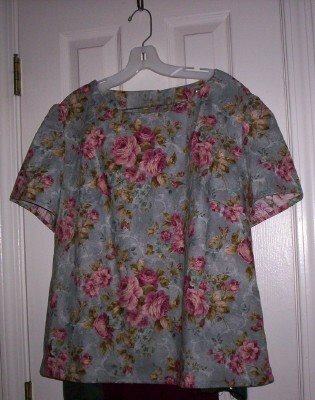 The Cabo pattern calls for 2 1/2 yds of fabric but I could have made do with only 2 yds. 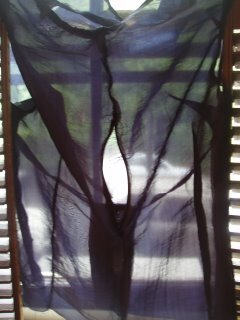 My fabric is non-directional though, so that could account for the extra. No worries, I want to make a cute little bag to go with this. Today the sewing machine gets moved to the dining room table. 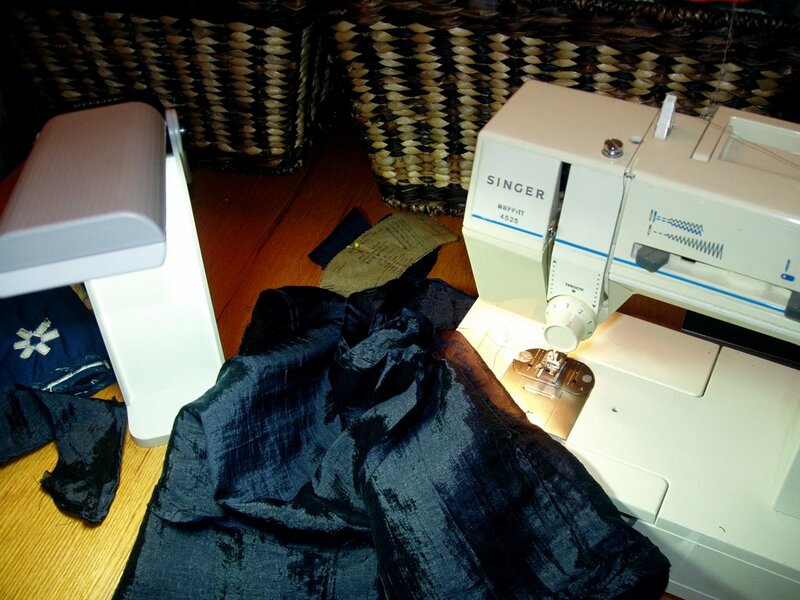 Not long now before actual sewing occurs.